Keeping mobile is the key to an independent life and whatever age your loved one is regular outings and physical activity is essential to their well-being. Exercise offers many benefits from strengthening bones to making sure that hearts and lungs stay in their best condition. Also, exercise creates adrenalin which makes you feel cheerful and more positive. As a bonus, exercise can also be a way for you and your loved one to meet different people and make new friends. Your local council or library will have details of a variety of clubs and activities available for disabled or elderly people in the area. Many local councils run classes especially designed for people with specific medical conditions such as heart disease or arthritis; swimming pools often have particular times when they are only open for the over 60’s. Being overweight is a health risk that makes it harder to enjoy exercise. It can increase the risk of heart and chest troubles, diabetes, backache and varicose veins – all of which will make your loved one feel worse and less mobile. If they need to lose weight, speak to their doctor or district nurse for advice. Don’t encourage them to skip meals or restrict their diet unless their doctor advises it. If the person you care for is able to, encourage them to get out for a walk everyday; a twenty minute walk will help maintain healthy heart and lungs. If they need supervision, you can go too and the exercise can benefit you both. Make it part of your daily routine to do some shopping, visit the library, enjoy the park or drop in to see a friend. Walking can be a gentle or exhilarating exercise that costs nothing. Do what you can to see that you and the person you care for makes the most of this simple activity. In your area there may be community transport services available to people who have difficulty using public transport. Local councils are also legally obliged to offer free off-peak travel on local buses to disabled people living in their area. There can be no charge levied for the disabled bus pass. Also, new single-decker and double-decker buses are specifically designed to be accessible to disabled people, including those who need to use a wheelchair. If your loved one travels by train, they can apply for a Disabled Persons Railcard. With a railcard, most journeys are then purchased at a reduced rate. Application forms are available from main railway stations. There are various local transport schemes around the country which rely on volunteer drivers to provide door-to-door services for older people and those with mobility problems. Contact your local council to find out the transport schemes in your area. If your loved one is no longer able to walk great distances, their independence will be made much easier if they can still drive safely. To help them to get around and park easily, they are entitled to apply for a Blue Badge. Alternatively, if your loved one is unable to drive and you, as their carer, drives for them, you may be entitled to apply for a Blue Badge.The Blue Badge allows people to park for free at places like parking meters and pay-and-display bays. It also allows extended parking where there is usually a time restriction as well as the right to park on single and double yellow lines. Gets the higher rate of the mobility component of the Disability Living Allowance. Has a serious physical disability which leaves them unable to walk. 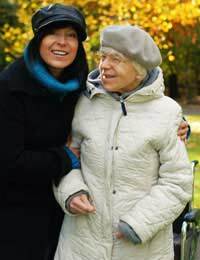 Applications should be made to the social work department of your local authority who will decide if your loved one’s infirmity qualifies them for a badge. If they do qualify for a badge, they may also qualify for exemption from paying car tax (vehicle duty exemption). Unfortunately there is no right of appeal in the case of an unsuccessful application.